Click to help us earn funds! Local Author W.L. Seaver! The stories in this books are all about local cats! 30 days of FREE pet insurance from PETFIRST! KITTENS $85 or 2 for $140!!! ADULTS CATS $65 two for $100! Cedar Bluff/Kingston Pike and Clinton Hwy locations. Grant recipient 2017! 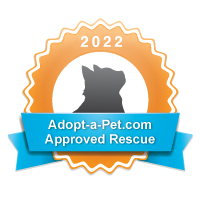 Thank you Radio Systems and Petsafe! Available at PetSmart Turkey Creek on Saturdays and Sundays and can be shipped for just $5! Need advice on Feline Care? Visit the Cornell Feline Center. Happy Paws Kitten Rescue is a non-profit organization dedicated to caring for, providing medical treatment, and re-homing homeless, abandoned, and abused cats in East Tennessee. We are also dedicated to promoting proper care of animals through community education and to strengthening the human-animal bond. "Callie the Rescue Cat" saves kitties lives throughout Knoxville, TN and the surrounding area. She works very hard to find homes for cats and kittens that have found themselves in unfortunate circumstances. Callie sometimes visits PetSmart on adoption days to visit her brothers and sisters and to see all the children. Come by and take photos. Would you like Callie to visit you at your Birthday party or special event? Give give us a call. Do you need help or assistance with a cat? Keep Your Pets Safe! Food Recalls! Grant 2017 recipients! Thank you Petco!! !